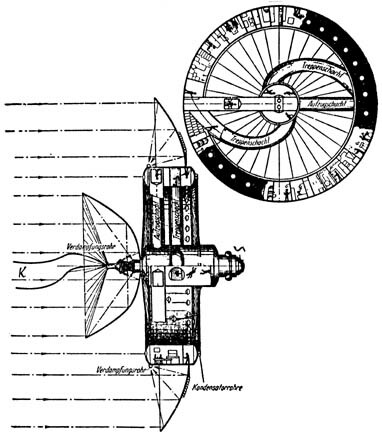 Noordung's space station concept of 1929. K is the electric cable to an external observatory; S is the airlock; Kondensatorrohre are condenser pipes; Verdamfungsrohr is a boiler pipe; Treppenschacht is a stairwell; Augzugschacht is an elevator shaft. 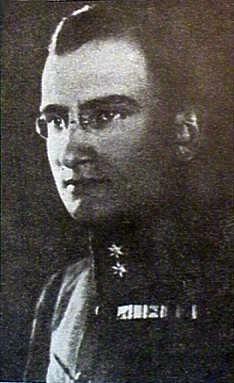 Herman Noordung was the pseudonym of Herman Potocnik, a relatively obscure officer in the Austrian Imperial Army who became an engineer and, encouraged by Hermann Oberth, published in 1928 a seminal book Das Problem der Befahrung des Weltraums (The Problem of Space Travel: The Rocket Motor)1,2 that focuses largely on the engineering aspects of space stations. In it, Noordung deals with issues such as of weightlessness, space communications, maintaining a habitable environment for the crew, and extravehicular activity. Noordung's proposed design consists of a 100-foot-diameter, doughnut-shaped structure for living quarters with an air-lock at its hub, a power-generating station attached to one end of the central hub, and an astronomical observation station. He was among the first to suggest a wheel-shaped design for a space station to produce artificial gravity, and also argued the scientific value of such a station in a synchronous orbit above Earth. The Sun would provide electric power, though not with solar cells, which had not yet been conceived. Instead, a large parabolic mirror would focus sunlight onto boiler pipes in a type of steam engine. For more power, a trough of mirrors would run around the station's periphery concentrating solar energy on another system of pipes. Like a flower, the station would face the Sun. Except for being two and a half times larger, Wernher von Braun's Collier's space station (see Collier's space program) closely resembled that of Potocnik and it is tempting to view von Braun as the latter's apt pupil. He certainly had the opportunity to read Potocnik's book (though published initially in its author's native language of Slovenian, it appeared quickly in German translation). Moreover, von Braun's concept included a circumferential trough of solar mirrors for power. This, however, came not from Potocnik but rather from a suggestion of Fred Whipple (who had not read Potocnik's book), and, thus, represented an independent invention. The influence of Potocnik on von Braun may have been only indirect. The historian John Hunley, who prepared an English translation of Potocnik's book, describes its influence on Von Braun as "probable but speculative." Nevertheless, he states unequivocally that "Potocnik's book was widely known even to people who may have seen only photographs of sections from the book in translation." His concept of a large rotating wheel was sufficiently simple to permit Von Braun and others to carry it in their heads for decades, developing this concept with fresh details when using it as the point of reference for an original design. (This paragraph was adapted from NASA SP-4221, ch.1). 1. Noordung, H. Das Problem der Befahrung des Weltraums (The Problem of Space Flight). Berlin: Schmidt and Co., 1928. 2. Noordung, Hermann. The Problem of Space Travel: The Rocket Motor. Edited by Ernst Stuhlinger and J. D. Hunley with Jennifer Garland. Washington, D.D. : Government Printing Office, NASA SP-4026 (1995).